Saleen Light Blade Tail Light Trim 08-14 Dodge Challenger Saleen Light Blade Tail Light Trim 08-14 Dodge Challenger, Dodge Challenger Stainless Light Blade Tail Light Trim, Challenger Stainless Light Blade Tail Light Trim, Dodge Challenger Stainless Tail Light Trim, Challenger Stainless Tail Light Trim, Dodge, [Saleen 03001-00011-6 Light Blade] - $329.95 : 3rd Strike Performance, Your Source for Late Model MOPAR Performance Parts and Accessories! 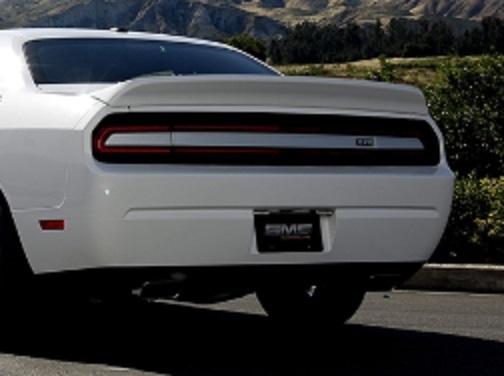 The S570 Light Blade Cover gives your rear tail-lights the same dynamic look of the Saleen 570 Challenger. This package gives the taillight of your Challenger the look and styling of the Saleen 570. Made in the USA, this tail lamp cover comes unpainted. Will fit all 2008+ Challengers models. Installation of the Light Blade Cover blocks the stock reverse lamps which is not legal for on-road use and may present an unsafe scenario. Includes SMS reverse lamp set. Need it installed and/or painted? Contact us to schedule install at our production facility or to discuss options. This item is available painted your Factory Paint code. To have yours custom painted, select "Factory Painted" from the "Finish" menu, and then enter your paint code in the text box. Please allow 7-10 days for these to be painted and shipped out. It is also available in custom hydro-dipped finish (please contact us for the films available). Please select "Custom Hydrodipped" from the "Finish" menu. We will work with you on this finish, as there are hundreds of films available. We also offer airbrushing on this item. Please select "Custom Airbrushed" from the "Finish" menu. Please understand airbrushing is a custom finish, and price depends on what you want done. The price listed in the minimum price for this service. Additional shipping costs apply to all custom finishes. Thank you.